Successfully Added Cleverdog Invisible Fence Dog Shock Collar to your Shopping Cart. 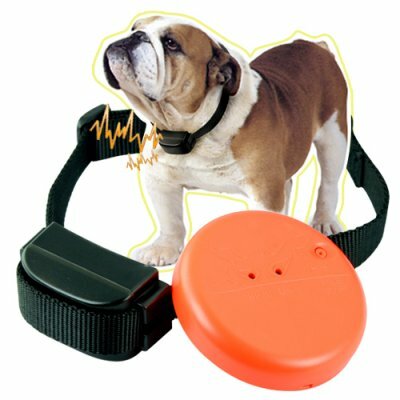 Behavior modification system that uses a vibration + mild shock dog collar and transmitting perimeter disk to ensure your dog doesn't stray into areas they're supposed to stay out of! Has your furry best friend ever done this? Put an end to this and more with the Cleverdog Invisible Fence Dog Shock Collar! How does it work? Place the orange transmitting disk in the area you want your dog to stay out of and power it on. Select "vibration" or "shock". Then place the receiving collar on your dog. As your pet approaches the disk, they will hear a beeping sound as warning. When they actually get within 1.5 meters of the disk, the collar will either vibrate or apply a mild shock based on your selection. The transmitting disk can be used to secure a circular area with a diameter of 3 meters and a perimeter of over 9 meters. It can also be used to secure an opening such as a doorway and even be hung on a wall. The practical applications are endless! Effectively and harmlessly control your dog's behavior with the Cleverdog Invisible Fence Dog Shock Collar! Keep them out of places they shouldn't be in whether for their own safety or your own sanity! And most importantly, remember that the shock is not enough to hurt your dog, but just enough to get them to change their negative behavior. In early stages, you can set the collar to shock so your dog knows to stay out or keep away from areas where the disk is. In later stages, just the "vibration" alone will be enough to get your dog to follow your orders. Ivan Pavlov, the most famous animal behavior scientist of our time, proved that this method really works! A great wholesale price makes the Cleverdog G103 Dog Shock Training Collar perfect either for the re-sale market, OEM market, or personal use. As always, it is only available direct to you from the original source for wholesale direct from China electronic products, Chinavasion. For their own safety, for your own sanity! Does your dog go into places it isn't supposed to? Do they sneak into the fridge or cupboard? SOLUTION: Invisible Fence Dog Shock Collar! The user should only use this device in accordance with the instructions provided and after consulting with your veterinarian. If your pet has a heart or other medical condition, then please do not use this product. You are responsible for ensuring that importing, sale, and use of this product is legal in your locality. Won't this hurt my dog? No one likes the idea of giving any kind of shock to their furry best friend, however the electric current produced by this device is very mild. Try it for yourself before putting it onto your dog. You will notice that the shock only provides a slight, temporary discomfort. Why does the collar come with two sets of studs? The collar comes with one set of short studs and one set of long studs. Depending on your dogs hair thickness, you can pick the set that works best with your dog. Can I use this collar on other animals? No, it should only be used with dogs. No, it is only water resistant, meaning it can be lightly splashed upon (like when your dog is drinking water) but should not be worn at the beach, during rain storms, or in other areas where it may be in constant contact with water. Can I use several disks to secure a larger area, but have them all act upon one collar? That would be an excellent reason to buy several of these units. Reseller Note: This factory direct, professional dog training invisible fence is finally available to the public at a wholesale price. If you need a smartdog / cleverdog / petsafe brand fence+collar training combination, get the OEM version at 1/4th the price - straight from Chinavasion!